Five kinds of rhinoceroses exist on the planet today: Sumatran, Javan and greater one-horned varieties live in Asia, while black rhinos and white rhinos make their homes in Africa. All are herbivores, subsisting on plant matter alone, and are classified as odd-toed ungulates, not unlike their cousins: tapirs, zebras and horses. Although rhinos are famously nearsighted, they have excellent hearing. These traits, and others, make for a complex but truly fascinating animal. Rhinoceroses are named after derivatives of two Greek words: rhino, meaning "nose," and ceros, meaning "horn." In fact, rhinos have been prized (and hunted) for centuries for their horns, which are thought primarily by individuals living in the Middle East and eastern Asia to offer a handful of health-enhancing agents. However, rhino horns are, in reality, just an incredibly dense protuberance of hairs that continue to grow throughout each animal's lifetime. As such, horns are not only unattached to rhinos' skulls, but, when consumed, provide no more medical benefits than other keratin-based body parts, like human fingernails. Even though some varieties of rhinoceros can weigh up to 5,000 pounds, the very same rhinos' peak running speeds average somewhere between 30 and 40 miles per hour. This is especially impressive when one considers that the top speed of a lean Olympic runner rarely exceeds more than 15 miles per hour over the course of a mile-long race. Rhino skin might resemble armor, but, in truth, is exceedingly sensitive to ailments like sunburn and insect bites. This is why, not unlike other hefty animals such as hogs and hippos, rhinos love to wade and roll in mud, which, after drying, acts as a barrier between the animal's skin and environmental irritants. 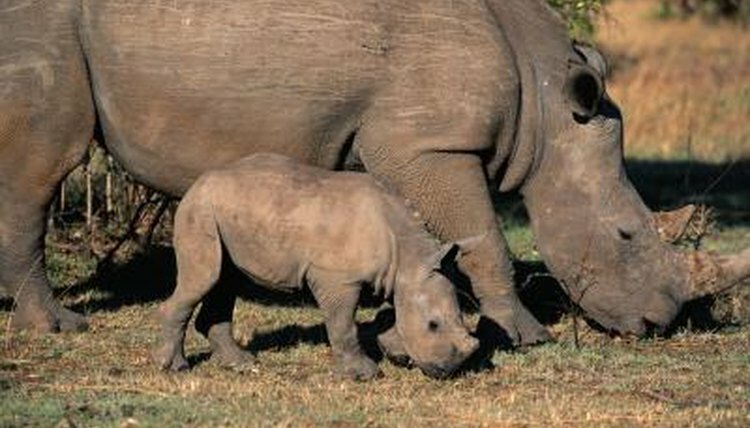 While rhinos don't have the best eyesight, they make up for the weakness by possessing an extraordinary sense of smell. In fact, the olfactory region of a rhino's brain -- the area that processes smell -- is by far the largest region. This is likely why most rhinos communicate, in part, with others by distributing piles of dung around the territory in which they live. The scent contained within these piles can denote whether the rhinos who produced them are young or old, male or female, or even females that are non-reproductive versus those that are ready to mate. Many people believe rhinos are particularly ill-tempered due to the fact that issues like poor eyesight make them jumpy. However, there is some truth in the idea that rhino aggression is singularly nasty. Black rhinos have the highest death rate due to intra-species violence among all known mammals; it has been reported that 30 percent of black rhino females and up to 50 percent of males die during violent intra-species confrontations. With the exception of the white rhino, rhinoceroses possess hooked, almost finger-like prehensile upper-lips that help them to pull vegetation into their mouths. Black rhinos have been known not only to use these prehensile lips to pick leaves from twigs, but also to open vehicle doors and unlatch gates.